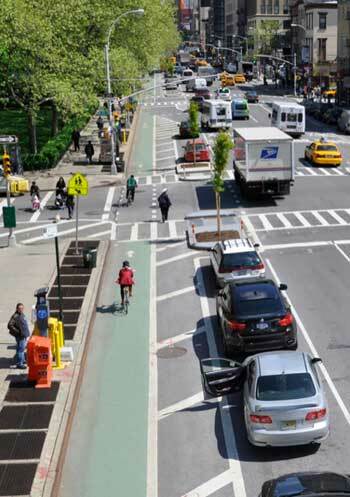 As more communities invest in green, complete streets to create environments that are both safer and more accessible for pedestrians and bicyclists, there are growing problems for those who must move goods, said Peter Plumeau, Resource Systems Group, at the Transforming Transportation conference in Washington, D.C. Complete streets by their definition must accommodate all users, but they aren’t doing as good of a job in accommodating trucks and delivery vehicles, which are critical to goods movement, argues Plumeau. For example, curb extensions, which have many benefits, are a great way to block access for a truck. And more people-friendly roundabouts, which feature tighter streets, are becoming a nightmare to get around. Plumeau said the answer is more creative thinking about how to move goods.